What an amazing mix of weather we’ve had over the past few weeks, days of glorious warm sunshine followed by snow and frosts, with the odd patch of very low cloud and rain thrown in for good measure! The good weather was a bonus for me as it brought the opportunity to finish my Wainwrights! I hadn’t started off intending to walk them, just the fells I could see from the house (16 from the front, including Grasmoor, Great Gable, Haystacks, the High Stile ridge and Melbreak.) Having done these, I thought it was a pity not to do the rest of the Western and North Western Fells and then just kept going! I had five Wainwrights left at the end of November but as they were all some distance away, high and with long walk ins, requiring clear weather and longer days, they had to wait. 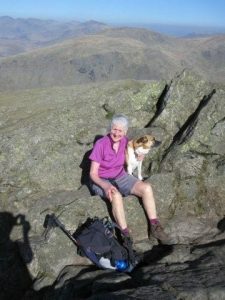 Not to waste the opportunity of such superb walking weather, Judy and I polished them off at the end of March, ending on Dow Crag in deepest Coniston! I enjoyed walking them and it’s satisfying to look at the fells and to think I have been on the top of them all! It has also joined things up and I have got a much stronger feeling of the structure of the Lake District. Some days just seem to be wild life days! The other Sunday, I was sat having my breakfast, looking out of the window and saw a greater spotted woodpecker on the nuts, a squirrel digging in the lawn and a weasel running across the front of the garden! 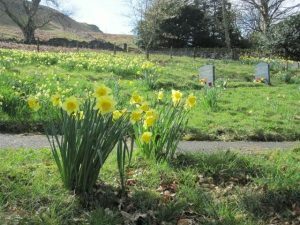 I then went for a walk with my friend, Hil, over High Rigg to St John’s in the Vale and Tewet Tarn, ending up for tea and freshly baked scones at the tea room at Low Bridge End Farm: a red squirrel was running backwards and forwards along the wall and a nuthatch was busy feeding upside down on the feeder. And then, on our way back to the cars, we saw a kingfisher flash along the river – what a day! 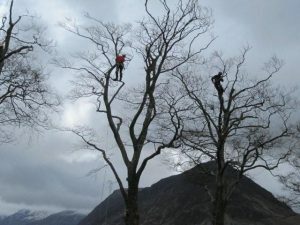 Today, I have been having some work done on the trees along the front by the road to keep them safe and hopefully prolong their lives: I thought I would include this picture!